When starting out to learn to play ukulele as a beginner it’s important to learn the cords for your songs to play. You can find over a hundred chords that can be played, some very easy and some ridiculously hard. Luckily most popular songs are made up of only a few basic chords, making it fairly easy to play some of your favorite songs. A chord is a collection of a few notes that sound good together, produced by playing more than 1 string at the time. A ukulele player should know the major and minor chords to be able to play the songs. There are a total of 7 major chords: A, B, C, D, E, F & G (corresponding to their root notes La, Si, Do, Re, Mi, Fa, Sol). Major chords have the characteristic of being “happy” or “joyful”, which makes them great for up-tempo songs. The image below shows how each of them is plated. In these diagrams the vertical lines represent the strings and the horizontal lines represent the frets. The dots represent the fingers pushing down the strings. You will notice that not all of these chords are easy to play. The B & E chord will take a lot practice to get right in the beginning. Luckily one of them, the E chord, isn’t used that much. The 7 minor chords, also regularly used in popular music, sound “darker” then the major chords. They give songs a more emotional and intimate feel. A minor chord is indicated by its letter (root note) followed by an “m” for minor. The most important to learn are Am, Dm & Em. They are the most common ones found in music pieces. The image below shows how they are formed. While for beginners it’s important to learn the minor & major chords, more experienced players can start learning some more complex chords like the seventh chords. These chords are used in more complex music pieces and are commonly found in jazz & soul songs as they add a “groovy” feel to them. In the image below provides the diagram for all major and minor chords as well as the seventh major & minor chords. When you get familiar with these chords it’s time to put them together and play some songs. There are lots of songs for beginners that can be played on the ukulele, like the popular Van Joyce’s “Ripide”. 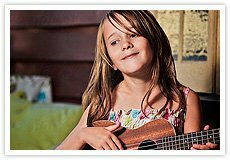 For more easy songs to play on ukulele check out the Songs page & the ukulele songs for kids page. The few basic ukulele chords you need to get started!